My father is 67 years old and suffering from Interstitial Lung Disease. He is in the ICU. 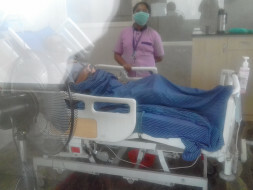 Now he is being given high flow oxygen without which he can't survive even for a minute. As per the doctor 95% of his lungs is non-functional. According to the doctor he is at the end stage of his life. We are finding it difficult to raise the fund to support his life as long as possible. Expecting help from all kindhearted people.